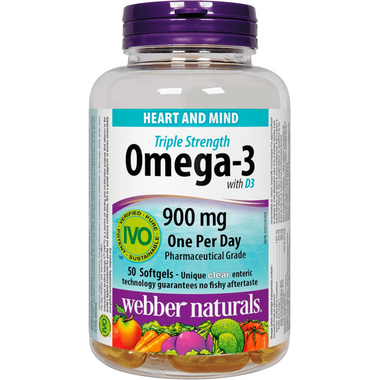 Support heart and mind with webber naturals Triple Strength Omega-3 with D3. This ultra-purified fish oil provides 600 mg of EPA and 300 mg of DHA in the ideal 2:1 ratio to promote cardiovascular health and cognitive function. Vitamin D in the highly bioavailable cholecalciferol form also encourages healthy bones and eyes. Recommended dosage (adults): 1 clear enteric softgel daily oras directed by a physician. Dry eye relief: Use for a minimum of1 month to see beneficial effects. Each clear enteric softgel contains: Fish Oil Concentrate* (anchovy, sardine, and/or mackerel) 1407 mg Omega-3 Fatty Acids 900 mg Eicosapentaenoic Acid (EPA) 600 mg Docosahexaenoic Acid (DHA) 300 mg Vitamin D3 (cholecalciferol) 1000 IU (25 mcg) *Molecularly distilled, ultra purified. Keep out of reach of children. Dry eye relief: Consult a physician if symptoms of dry eyes worsen.